VITRATOX #53 Wheat Germ Oil capsules contain 73% wheat germ oil, an excellent source of the natural vitamin E complex; and 27% flax seed oil, a rich source of unsaturated, essential fatty acids: linoleic and linolenic (omega-6 and omega-3). 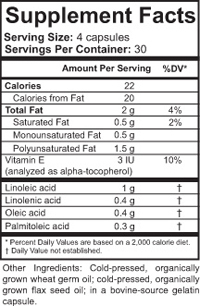 Vitamin E is an essential dietary component that is necessary for antioxidant activity in membranes. It regenerates other cellular antioxidants (i.e. selenium and glutathione) after they become oxidized. * The essential fatty acids also must be obtained in the diet, and are precursors for many hormones and metabolically active compounds. Light, oxygen and high temperatures destroy vitamin E and fatty acids very rapidly. Therefore, the wheat germ and flax seed are pressed at a low temperature in the absence of light and oxygen. The oil is then encapsulated in a bovine gelatin capsule for protection and easy consumption. 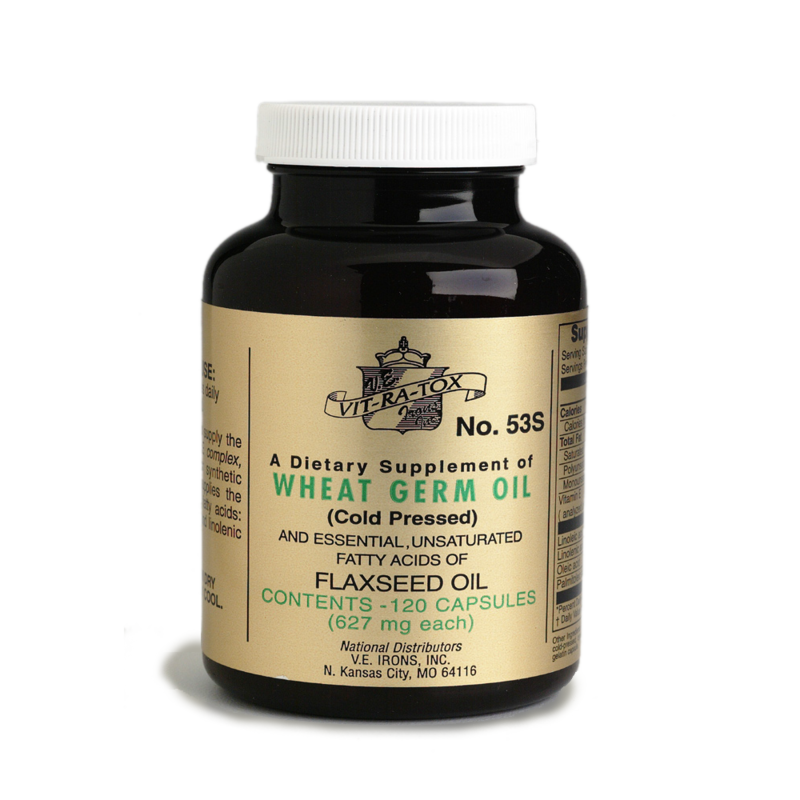 VITRATOX #53L Wheat Germ Oil comes in 11 minim capsules. Each capsule supplies 456 mg of wheat germ oil and 171 mg of flax seed oil. Flax seed contains two to three times as much essential fatty acids per unit weight as does wheat germ oil alone. Hence, we use both to get maximum nutrition per capsule. Great care has been taken to obtain a Wheat Germ Oil that still retains the nutritional “life” and vitamin E complex contained in the oil. Routinely tested for oxidation, our Wheat Germ Oil is extracted from the original wheat germ sac by a “cold rolled process” wherein the sac itself is first given an electric “flash heat” to soften it so the cold rolls can extract the oil. It must then be refrigerated immediately to prevent rancidity and it remains refrigerated until it is put into capsules. Because the natural vitamin E in our foods is destroyed during cooking and processing due to heat, light, air and freezing, grains lose up to 80% of their vitamin E content when milled. Therefore, it has become quite clear that there is a need for natural vitamin E supplementation in our modern diets today. 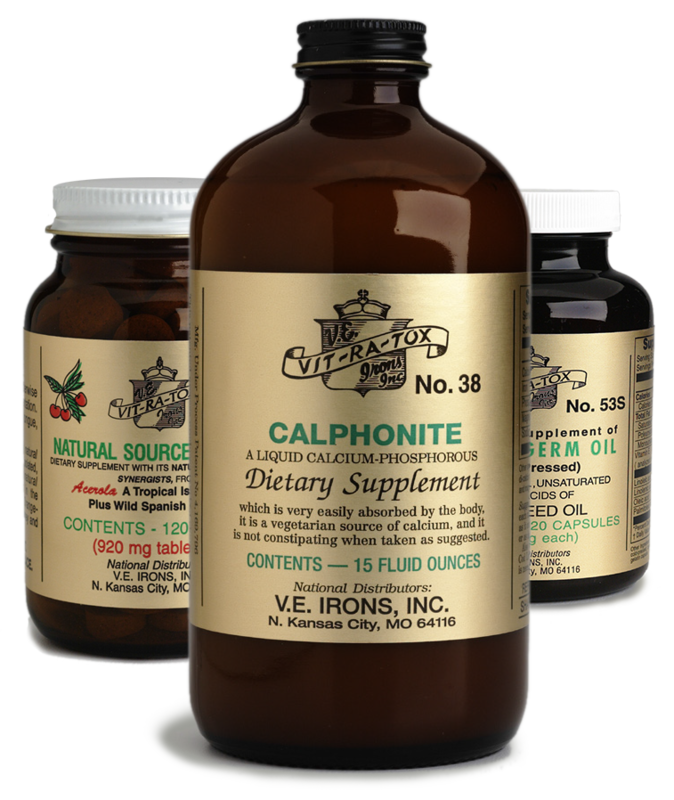 This product is a key component included in our #59 7-Day Cleansing Kit. 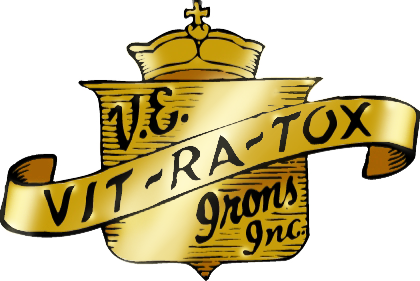 VITRATOX #53L Wheat Germ Oil is packaged in a recyclable shatter resistant amber bottle. This product comes in two convenient sizes 53L with 360 capsules and 53S with 120 capsules.